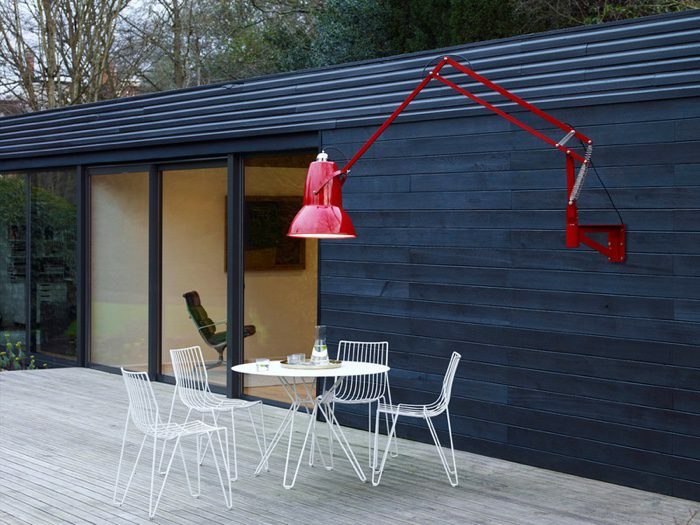 The Anglepoise original 1227 giant outdoor lamp makes a huge statement in any garden. Pop this on your wall and you’ve nailed a showstopper. Tack it to your shed and you’ve taken your garden to the next level. It can’t fail but become a talking point for anybody that sees it. It is often tricky to get lighting right in the garden. Unlike interiors, outdoors has the problem of not being able to mount lights from above. Lights tend to be either sunk in the ground, or need something to bounce off to create a beam. If you can light from above it is always preferable as it creates fabulously atmospheric pools of light perfect for outdoor evening dining. This beauty allows you to do that, with a dazzling array of gloss colour finishes to choose from. The price tag is breathtakingly tricky to swallow. At £2,850 it is not for the faint-hearted. I certainly can’t see me getting one any time soon, and it would take some persuading to encourage the client to splash out. However, what a bobby-dazzler. It would leave all of the other garden features in the shadows. Well worth adding to any Pinterest board to dream of getting one day.